Japanese astronaut Kimiya Yui soars through the Destiny lab module. The six-member Expedition 44 crew participated in a wide array of science today as Japan counts down to Wednesday morning’s launch of its fifth resupply mission. Meanwhile, three new Soyuz taxi crew members flew to the launch site at the Baikonur Cosmodrome to finalize their mission preparations. The majority of the station crew members had their blood pressure and vision checked today for the long-running Ocular Health study. 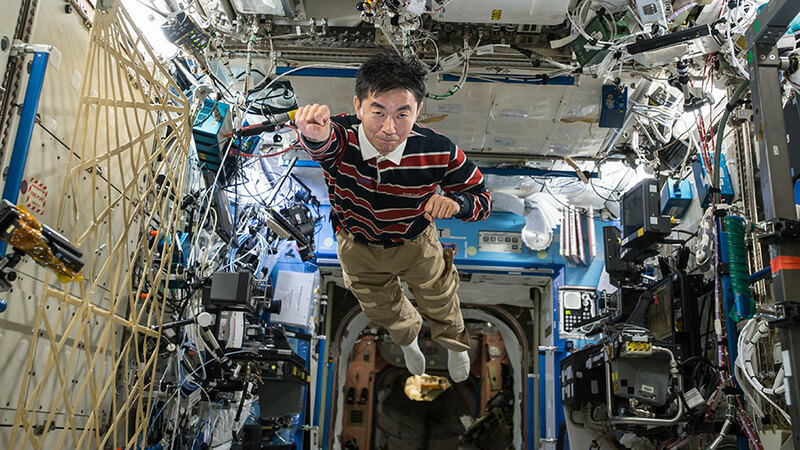 Japanese astronaut Kimiya Yui had his legs scanned with an ultrasound for the SPRINT exercise study. NASA astronaut Kjell Lindgren explored fluid physics and surface tension for the Capillary Beverage experiment. Back on Earth, veteran station cosmonaut Sergei Volkov and first time Soyuz Flight Engineers Andreas Mogensen and Aidyn Aimbetov are getting ready for their 10-day mission to the International Space Station. The trio will launch Sept. 2 inside the Soyuz TMA-18M spacecraft from the Baikonur Cosmodrome in Kazakhstan. Volkov will stay in space until next year. Mogensen and Aimbetov will return Sept. 11 with Gennady Padalka who has been in space since March. The Japan Aerospace Exploration Agency (JAXA) is getting ready to roll out its H-IIB rocket this afternoon at the Tanegashima Space Center. JAXA is scheduled to launch the “Kounotori” HTV-5 cargo craft at 7:50 a.m. EDT (11:50 a.m. UTC) Wednesday for a five day trip to the space station. The HTV-5 will deliver more than 4.5 tons of research and supplies, including water, spare parts and experiment hardware. Could be cool if some astronaut could also use the superman clothes, when soars through the Destiny lab. Flight Engineers Andreas Mogensen and Aidyn Aimbetov are only aboard for less than two weeks, that is interesting. What are they’re mission goals? Their mission is to deliver a new station crew member Sergei Volkov who will stay in space until March. Current station Commander Gennady Padalka will swap seats with Volkov and return home with Mogensen and Aimbetov. First time space flyers Mogensen and Aimbetov will participate in science activities for their respective space agencies. Space station crew members often report they get the best sleep floating in weightlessness. Crews are scheduled for 8 hours of sleep in space.